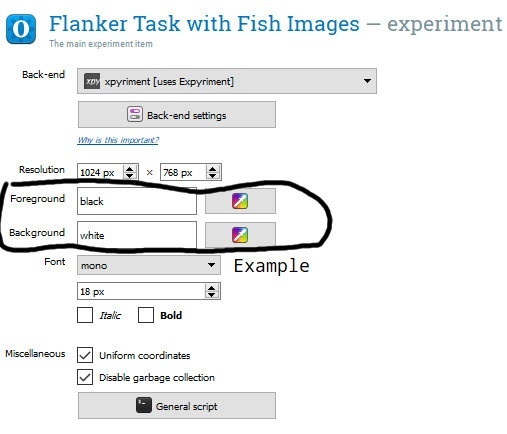 As in a previous tutorial we are going to create a version of the Flanker Task. In this version the task is to respond, as quickly and correct as possible, to the direction a fish is swimming. There are two conditions. First, in the congruent condition the fish will be surrounded by other fishes swimming in the same direction (e.g., all fishes swimming to the right). Second, in the incongruent condition, the surrounding fishes will be swimming in the opposite direction. Note, regardless of condition the fishes may be swimming to the right or left. In the OpenSesame experiment we will create here, there will be 4 practice trials and 64 test trials. Each trial, whether practice or test, will start with the presentation of a fixation dot for 2000ms. After the fixation dot, an image will be presented (also for 2000ms). 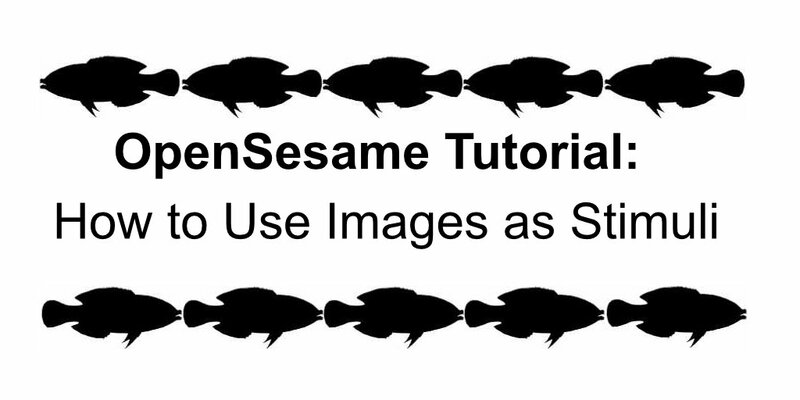 The last layout in OpenSesame can be seen in the figure below. 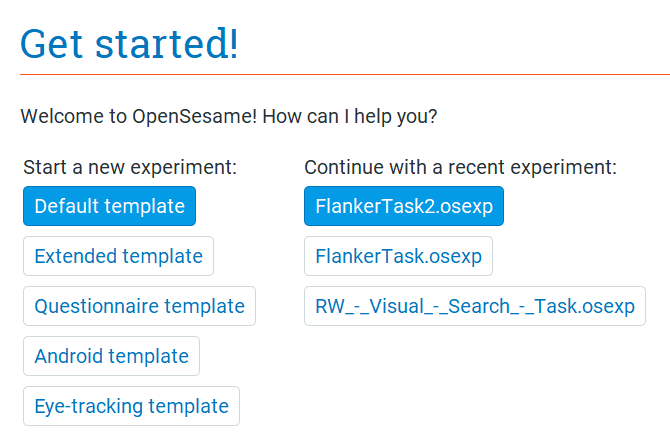 Depending on your needs there are 5 different templates that can be used when creating an experiment using OpenSesame. 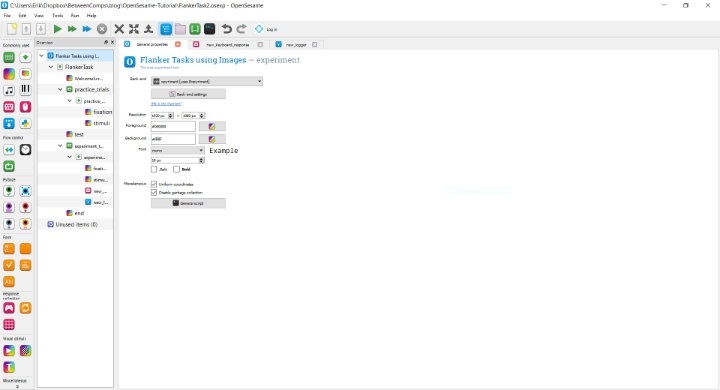 In this tutorial we will use the “Default template” by clicking on File and then New. 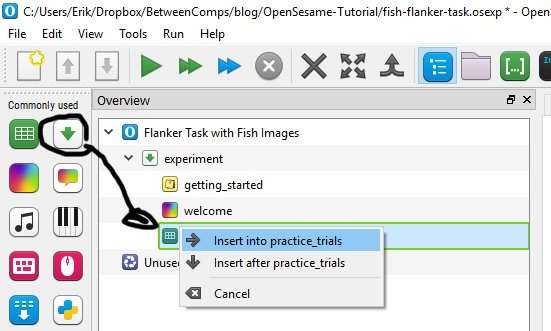 We continue this OpenSesame tutorial with the first loop for our practice trials. This is done by dragging and dropping the loop object to under the welcome sketchpad. 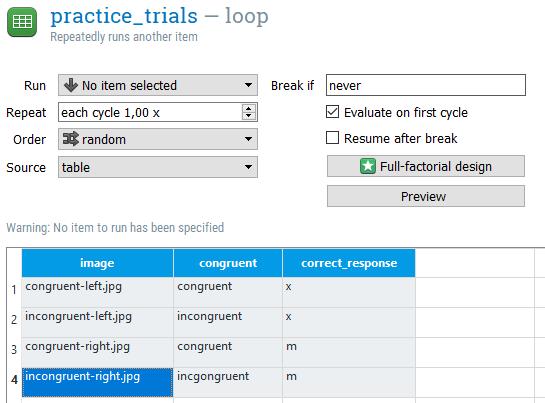 We give it the name “practice_trials” by clicking on the new_loop (blue text). In our case, we add 4 trials and name the columns, image, congruent, and correct_response. Furthermore, in the image column, we put the four different images that we are going to use (“congruent-left.jpg“, “incongruent-left.jpg”, “congruent-right.jpg”, and “incongruent-right.jpg“). Continuing with the task, in the column congruent we type in “congruent” . Remember to match the filenames. Finally, we add the correct response in the last column (“x” for when the middle fish is swimming left and “m” for when its swimming to the right). We will continue this tutorial by creating something called sequence. Items in a sequence are executed sequentially and is used to place the fixation dots/crosses, and stimuli (e.g., images, text). The sequence is going to be placed in our practice_trials loop. We will name it practice_seq and here we will add the fixation dot and flanker stimuli. 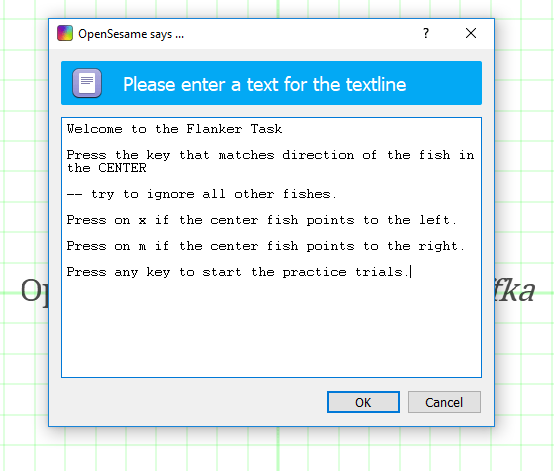 We continue the OpenSesame tutorial by adding a fixation dot to the sketchpad. This is very easy; we just click on icon that looks like a cross hair, on the left of the grid, and then click with the pen in the middle of the grid. 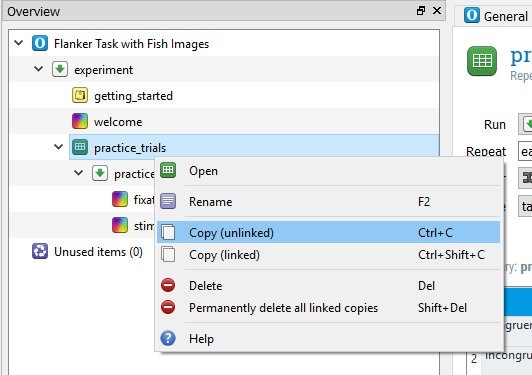 Now we can right-click again (or press ctrl-V) and choose to paste our copied loop, including the sequences and sketches, after the practice trials. 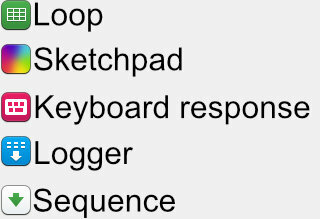 Before we add the keyboard response and the logger we rename the new loop to “experiment_loop” and the new sequence to “experiment_seq”. 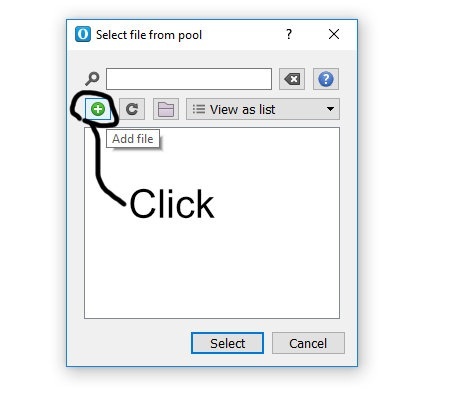 In this sub section we are going to use some coding and can be skipped if you want to create the file by hand. To be able to run this code we need to have Python and Pandas installed (tip: install Anaconda Python distribution to get both). In the first code chunk we import pandas as pd as well as shuffle from random. Next we create a list of Python dictionaries. Notice that the keys are the filenames and the values are the correct responses. In the final code chunk we are creating a new dictionary (trials). This dictionary will contain all information needed for OpenSesame to run our Flanker task. In the following for loop we get the first key from each dictionary in the list of total_trials. This variable will contain the image name for each trial. After this, we will get the condition (congruent or incongruent) by spliting the string and taking the first item in the resulting list (image.split…). We continue by getting the correct response using the image as key. Next, we append everything to the lists in the dictionary (i.e., trials), Finally we create a dataframe and then use to_csv to save the file. Click Browse and click the green and white plus symbol to add your file. After adding the file make sure you select it! 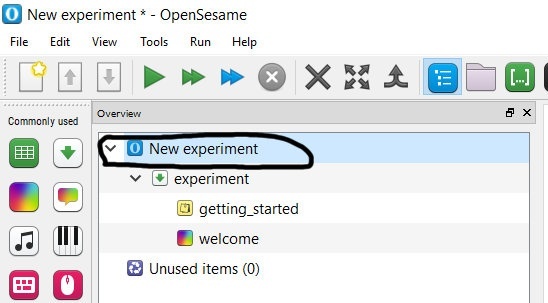 In this section of the OpenSesame tutorial we are going to learn how to record responses. 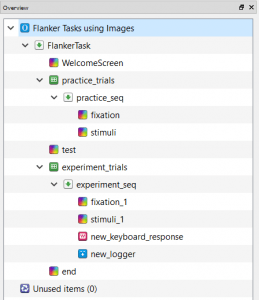 Additionally, in the flanker task we are creating we are going to let the participant’s use the keyboard. As with everything else we just drag and drop the keyboard response object into our test_seq sequence. Here we add “x;m” in Allowed responses (without the “”) and “1200” in Timeout. Finally, to get responses recorded we will add logger by dragging and dropping the object into the test_seq sequence. There’s one last thing we should do; add a sketchpad after the test. Drag and drop a sketchpad object to the test loop and choose after test. In this sketchpad we’ll add the text “Thanks for participating”.